The heiress of Catton Hall died on her wedding night, and they say the corn waved and cattle cavorted as her ghost walked the path to marry her lord. Elizabethan brides wore a wreath of herbs, long free hair, and carried a nosegay on a ribbon. May blossom on hawthorn is still for some considered unlucky if it's brought in the house. The yew tree is a new type which was being imported in the 1600s, and forms the present avenue in the parish churchyard. The herb garden would be typical of her old home where there would be plants for medicine and cooking, maybe strawberries, and box hedging neatly clipped in a pattern. Front gardens along Magdalen and Sprowston Roads were still like this when we arrived in the nineneen fifties. White Woman Lane's cornfields are lost under housing now. 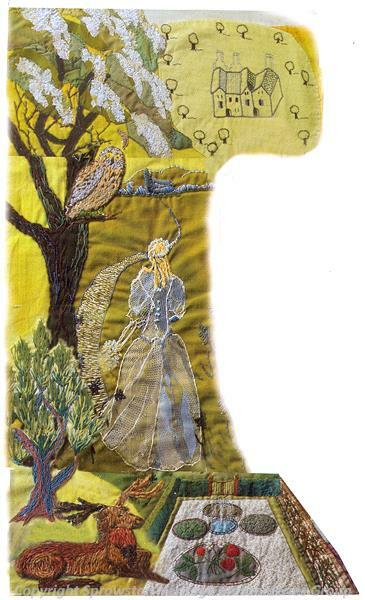 Detail of Panel Three of Threads of Time depicting the legend of <?xml:namespace prefix = st1 ns = "urn:schemas-microsoft-com:office:smarttags" />White Woman Lane. 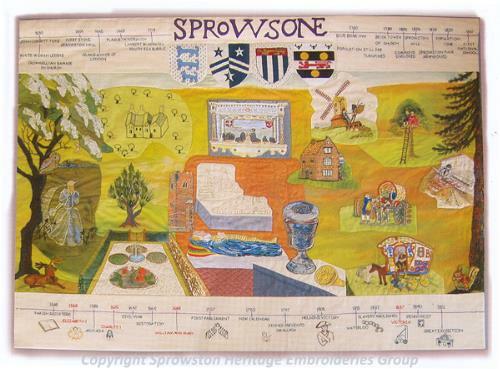 The tapestry also features a Bronze Age cemetery, St Mary and St Margaret's Church, Sprowston Mill, St Cuthbert's Church, Sprowston Hall and Mousehold Heath aerodrome.